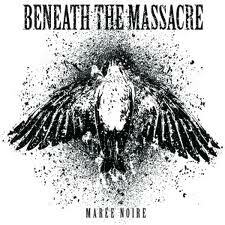 Beneath the Massacre's latest, Maree Noire, is a good reminder to their fans why they love them so much, and a small stopping gap before they release their next record. Maree is an ep, so the running time is on the short side. 13 minutes, according to iTunes. So, by the time the cd's done, you'll still have half a burger and pop left to go. Those 13 minutes are not wasted, as the band throws enough tech-metal at you that you just want to listen to it over and over again. Guitarist Christopher Bradley just comes like a monster on all tracks, widdling the fret board like a madman. Lead singer also gives a great growling death metal performance, and is probably the only one who can make you not pay attention to the awesome wankery. There's not much else that you can write about five songs, and even one of those is a short interlude. However, it does give the listener a good idea where Beneath The Massacre are heading on their next record. Now, with Despised Icon calling it a day, it may be time for Beneath The Massacre to claim the Canadian heavy metal throne, and Maree Noire is a good reason to give them the crown.